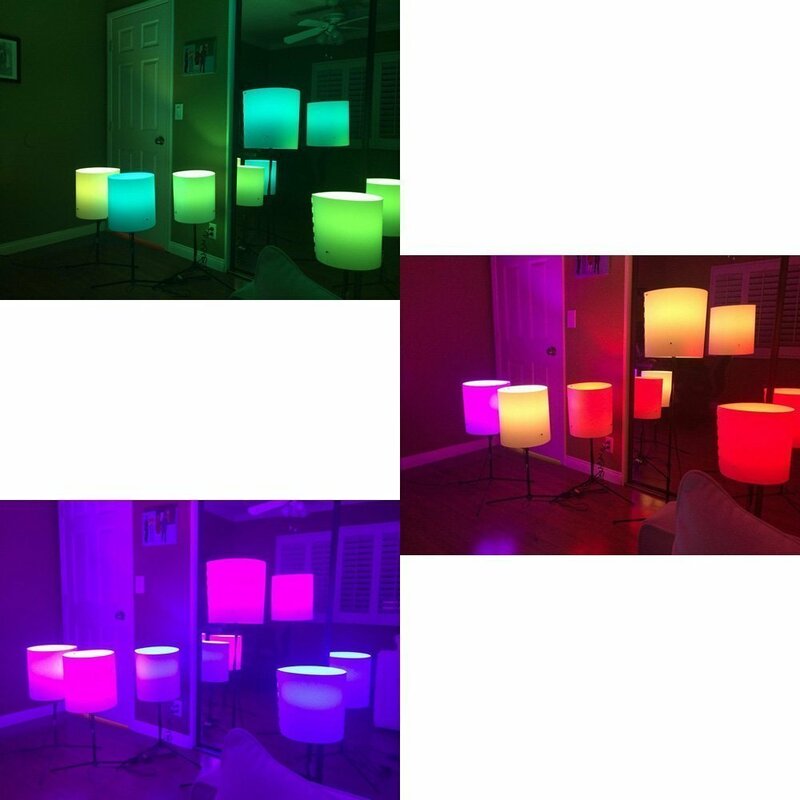 Hi everyone my name is Erik and thanks for checking out my review on the Mood Light Magic LED Bluetooth Bulb. I’m going to go over all the functions and show you how to set up different moods scenarios. This is the bulb, I’m using these lamps for demonstration. You can pretty much any lamp you want but for the best results, I recommend a white shade that is pretty thin or preferably frosted glass. Unlike a lot of other Mood Lights, you can get pretty specific colors. Some of the colors on the circle don’t match exactly to what’s showing in the bulb but its close enough. The brightness level is about equal to a 40 watt incandescent bulb. 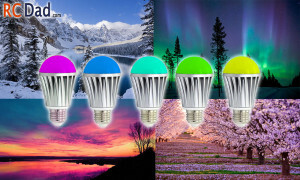 What’s great about the Magic Bulb is it only uses 7 watts of electricity so if you’re using it for a normal light you’re going to save on your electricity! The build quality is really nice, you have these big cooling fins on the sides that will protect bulb from heating up keep it lasting a long time. When you open your app you’ll see a list of bulbs within range of your device. When you select the bulb you want the first page is your solid color page. Here you can pick whatever color you’re in the mood for, or set your favorite color as a pre-set that will save in the boxes here. Under those you have your brightness control. Next you have the “Warm” setting, which is the brightest. This setting makes it look like a normal 40 watt bulb. 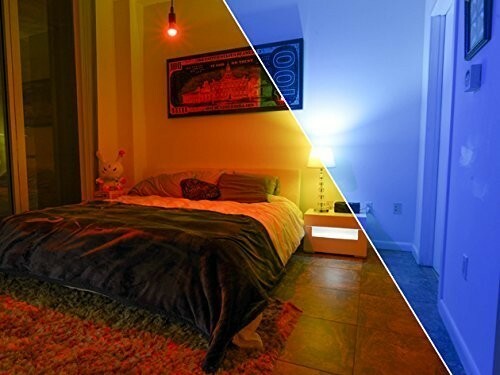 The color is between a 2500 – 3000k Bulb and that just means it’s a warm white and doesn’t get pure white. This wheel will brighten or dim the light. These two little circles will turn it either up 100% or 1%. Next is the “Functions”. You have 20 different functions and you have control over the speed on all of them. Next is the customization modes. This is one of the biggest advantages of this Mood Light over other brands. The Avea Elgato has a similar feature where you can choose from preset moods like “Magic Hour” “Northern Glow” “Cherry Blossom” and so on. But it’s limited in customizing them. You can create your own ambiance by simply selecting the colors from each photo. For example “Sunset” has some dark blue, pink, light orange, and purple. You can mix it up however you like and adjust the speed. If you want more a club effect you can select “Strobe” or “Jumping” and give yourself a headache. Some of the other ambiance presets I have is “Northern Lights” “Cherry Blossom” and “Mountain Breeze”. The great thing about having more than one bulb is to get the alternating colors at different times to really bring on a cool atmosphere. Lastly there’s a wake up feature. You can set this light to turn on at any given time. It is in military time so it has a 24 hour clock so if you’re used to seeing a 12 hour clock this might be a little confusing at first. Instead of going from 11am to 12 to 1pm, it goes from 11 to 12 to 13 and so on. 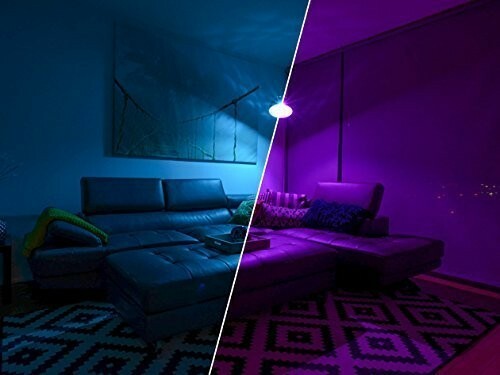 If you want to display the colors sports team, your partner’s favorite colors, or to set whatever mood you’re into, you’ll have more control with the MagicLight. It’s also the most affordable one in its class. You’re not going to get any flickering like some of the cheaper ones out there. *I wouldn’t recommend using this on a wall dimmer or the 3 step dimmers. I’ve read that those will cause flickering and could damage the bulb. Also, don’t expect this to brighten up an entire room, it’s bright but remember it’s comparable to a 40 watt bulb.